At 4:45 AST today Liam and I will be winging our way to Ontario for 10 glorious days of being spoiled by Grandma and Great-Grandma and Aunt Hilary and Grandpa and probably a few other people too. The weather is supposed to be HOT which will be a lovely change from the damp and dreary that we have been experiencing in the Maritimes. Our trip is going to include a day at African Lion Safari, the Lego store, the Children's Museum and lots of other fun stuff in between. 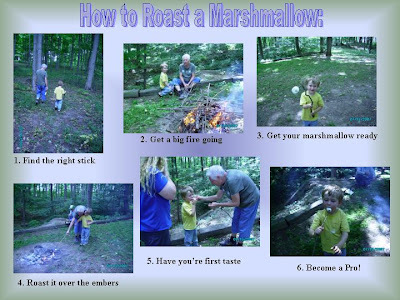 There will likely be a marshmallow roast on an open fire at the cabin where Liam first learned this art form. We will also celebrate Canada Day while we are away. Canada Day is Liam's second favorite holiday. It usually involves bouncy castles, rides, snow cones and fireworks. What's not to love? I will however be without computer access for the whole time! My parents don't even have cable so the idea of internet access is laughable! But the break will be great. Time to read and relax and enjoy some of my parents homemade wine! I'm sure I will take a gazillion pictures and have lots of stories to share when I get back! Till then, have fun!!! I pretty much had forgotten that today was Father's day. I haven't been to the mall in a while, so I've missed the splash of ads and cards for sale. Hilary and I, however, do have fathers. Hilary has 2~ her father, and her step-father. He step-father has been in her life since she was 3 and is the main father figure that she grew up with. 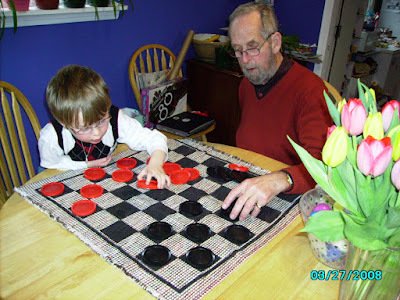 Grandpa (Hilary's step-dad) and Liam play checkers. 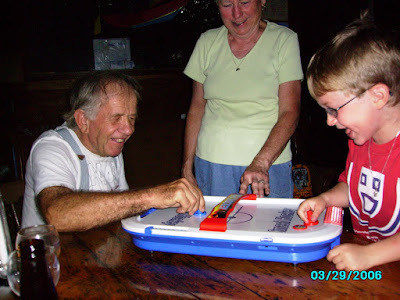 Liam plays air-hockey with my father. 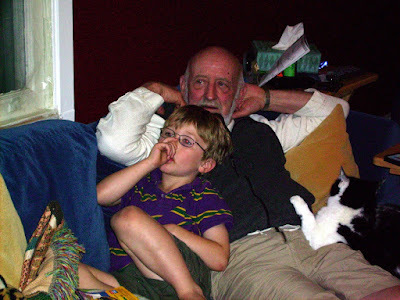 Liam and Grandad have some quiet time together. Our house has a retaining wall all around the front yard. It's not structurally needed except for the side where the driveway is. When we bought the house three years ago, this piece by the steps was leaning out about a 1/4 of an inch. Now, it's closer to 2 inches. I'm pretty sure that if I sat on the grass and pushed with my feet I could knock the whole thing over. The rest of the wall isn't in great shape either. So we called around and got some quotes. I was floored to find out that the range between having it taken out and having it replaced was over $5000. We've decided to go with the much cheaper option of having it removed and a nice slope put in. Now if it could just stop raining for a few days, we might actually be able to get the work done. One of the many things that we love about Liam's school is their focus on music. The music teacher Maggie is AMAZING! She nurtures a love for music in all the kids and finds ways to get them involved and interested. This year alone Liam has come home with at least 5 musical instruments that they have studied, made and learned songs to play them to. Next year he will join the band, starting with a recorder and will have the opportunity to try out a variety of instruments. Liam is torn between guitar, full size concert harp and bag pipes (we live in the Maritimes, they are hard to avoid!) It will be interesting to see where his interests take him! Next year Liam will be in a class called "Middles". Since they are split-year classes, he will be referred to as a "Young Middle" as opposed to an "Old Middle". It only gets more confusing as time goes on. Eventually he will be an "Old Old". This is what happens when an experimental school in '60s lets the kids name the classes! Summer will be a variety of lazy days at home, trips to the beach or museums, summer camp and a vacation at Grandma's house. The scheduling got so complicated that we now have an excel spread sheet taped to the cupboard door next to the calendar! I just hope we have some nice weather soon so that we can enjoy it! Princess Anne with a copy of my Father-In-Law's book Blue Heaven. She was planning on leaving the house at 5:00 this morning for the hour and a half drive to the city where she is having her Macular hole surgery done. The surgery itself is only about an hour and then there will be some recovery time. After that she starts her 7 day stretch of having to keep her head down so that the surgery site can stay dry and heal. I order her this device to help support her neck and my father rigged up an old army cot with a head rest for her to sleep on. After leaving the hospital today, her and my father will stay at a local inn over night and she will go back tomorrow for a check up and then they will drive home. I'm hoping that my father will call me tonight with an update. The place where they are staying doesn't have phones in the rooms, so I can't call them. My father is not very phone-friendly so I guess I'll just wait and see. Otherwise it will be late tomorrow before I hear how she made out. My mom called Hilary's Aunt (who lives in the same city where she had her surgery) to let her know that all is well! My mom's calling card wasn't working, so she couldn't call us, but was able to make the local call. I am taking a stab at the inaugral Open Adoption Bloggers Roundtable by answering the question "What one thing about open adoption would you tell your past self, if you could?". 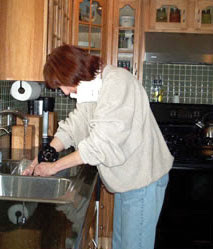 You can check out other blog entries here. Hindsight is such a double edge sword. You can use it to look back on things and not make the same mistakes again or you can look back on things and lose yourself in the What ifs and If onlys. It was seven years ago last month that the idea of adopting even entered into the realm of possibility for Hilary and I. We had not planned on adopting, in fact we were on a break from trying to get pregnant using donour sperm. Adoption found us through one of our co-workers whose sister was expecting and making an adoption plan. So by default of being what I now know to be called a pre-birth match, we entered into an open adoption. I didn't really know anything about Open Adoption, other then the fact that everyone would know each other. This was such a stark contrast to my own, very closed, very secret driven adoption, that I embraced the concept head on! The one thing that I never anticipated about Open Adoption was that Liam's mom would not embrace it like I did. That she would not return our letters, that she would move and not give us forwarding information, that we would lose contact with her completely. Suddenly my vision for Liam, growing up knowing his roots, having a relationship with his older brother and extended family, being able to ask his mom any question he wanted, evaporated. This was not the Open Adoption I wanted. But I was (am) mostly powerless to change it. So I would tell my past self to talk to Liam's mom more before she disappears, to explain to her what it means to be an adoptee who grew up with no information and no relationships with my siblings and tell her how all of that will be so important to Liam one day. I would offer to get her help and counselling to get her through the hard times. I would do everything I could to make sure that she took the opportunity to meet Liam the day he was born so that she could spend time with him and be able to say good-bye to him. I would ensure that they both had pictures of them together on that special day, something that can never be replaced. I would reach out to her during the 17 day waiting period, letting her know that we cared about her too, and not just her baby. I would do everything and anything I could to help ensure that this intended Open adoption stayed open, for everyone's sake. We try to be environmentally conscious when we can. We Reduce-Reuse and Recycle. The problem with reusing is that it sometimes takes more work then I'm willing to do. Take plastic food bags. Once you use them, you have to wash them, dry them find somewhere to keep them (because like anything else, once you take it out of the manufacturers box, you are NEVER getting it back in there). So we've gotten into a habit of putting all the bags that need to be washed into one big bag. The problem with that is that as the number of bags grows, so does the dauntingness of the task! So it was that I was faced with a huge pile of bags this morning when I was struck by a moment of genius! I had already thought of and discarded the idea of putting them in the dishwasher. I figured the water would be too hot and they would melt, or they would just fly all around the machine and I didn't want to risk breaking it. And that is how I thought of the washing machine! Ours is already a *little* bit broken, so if I broke it with plastic bags it wouldn't be so bad! So I gathered my bags and set to work! A little bleach, a little dishwasher soap and a gentle cycle and I was good to go. Of course in my excitement I hadn't thought the plan out to the very end. It's all very nice that I have this huge pile of clean bags, but where the heck was I going to dry them? It's raining here today, so the laundry line was out (that and Hilary doesn't like the idea of drying the bags on the line...don't ask, I don't know why). When we only wash a few, we use the spaghetti rack for drying them, but I had way too many today. So I got some towels and some string and I'm all set! I just have to remember to duck when I need to use the washroom!